FACE the sun, love your skincare. With bright and hot times in full humid gear lately, the sunscreen situation needs even more care. Though the idea of piling on the SPF while out in the sun is far from foreign to most of us, the thick white creme on our face and body no longer needs to be a part of the equation. While the weather and climate changes in the environment are more evident nowadays, skin protection and high SPF is daily must every season! An re-applying the high SPF is yet another hassle on the go, especially on humid days. 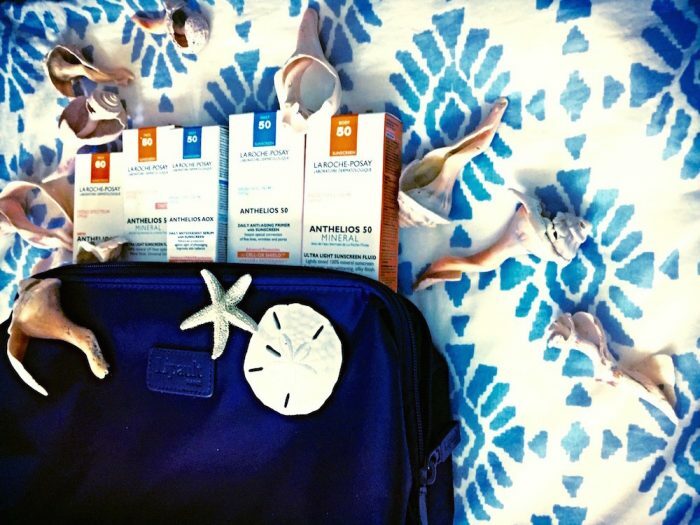 So, on a quest for practical sun care now and year-round, we checked out some formulas from the kings of anti-solaire and award winning suncare, La Roche Posay, and came up with a few must haves for your weekend bag. And on that note, we paired this tried and true go-to with a favorite travel | cosmetic bag from Lipault Paris. The newest addition with real SPF benefits: la Roche Posay Anthelios 60 (Cell-Ox Shield XL antioxidant technology). The Advanced Broad Spectrum formula comes in ultra-light formula in white and matte finish that is absorbed quickly in your skin This new blend lasts 2x the amount of time before re-applying, water resistant for 80 minutes, and helps reduce the appearance of sun damage- with a beautifying effect on your skin. and a shorter list of ingredients. Advanced Broad Spectrum sunscreen protection in a revolutionary ultra-light texture. 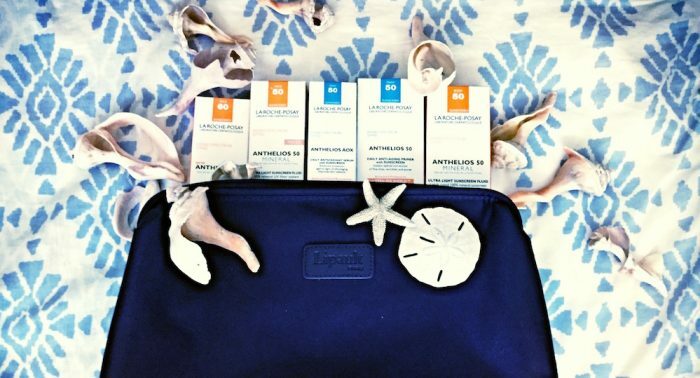 from the editor: I have been using the Anthelios 50 Mineral Tinted sunscreen line for more than a year now and repurchased it 3x already even through winter. Why? the smooth lightweight formula goes on like a serum, and is easy to apply under eyes without giving you creases. Your skin then gets overall coverage, and is perfect to layer + contour for a more natural look from summer to winter. Bonus prize? this formlula makes me glow while remaining protected. It also comes in a white (clear) formula if you prefer to put your own tint on. But this SPF is good enough for me to use as a light skin neutralizer before makeup. Day or night, summer or winter. Water resistant for 40 minutes. The Anthelios 50 Mineral Tinted sunscreen comes in a clear and tinted formula. The daily Anthelios SPF 50 Daily Anti-Aging Primer with Sunscreen- Hello technology x SPF. Applying this primer will act as a filler for fine lines, wrinkles and pores, creating a smooth, even surface for makeup to go on smooth. The mattifying texture will also remove imperfections which is great that I can apply makeup without worrying about product buildup or not fully protecting my face from the sun. I like using this before an event, or when I’m going out for coffee with’truly’ bare skin. UVA/UVB + antioxidant technology, can be used with or without makeup. Anthelios AOX Daily Antioxidant Serum with Sunscreen acts as moisturizer as well as a protective measure against the sun, combatting the effects of too much sun exposure. For someone like me who loves spending time outside, a product that can protect and help improve dark spots from sun damage is a great help. The serum texture is silky and can replace any serum with a bonus of SPF 50 protection and high-potent antioxidant complex. Similar to the Anthelios 50 Mineral Tinted face sunscreen, the weightless texture of the Anthelios mineral body formula is just as great. The directions suggest applying the product 15 minutes before sun exposure and reapplying after 40 minutes of swimming or sweating. One problem I always have with my sunscreen is the white residue that they all leave behind; this product goes on smooth and blends easily, no one can tell that I have it on. Plus, it kind of evens out the tone and is suitable for sensitive skin, with water resistance of 40 minutes and SPF 50 protection. 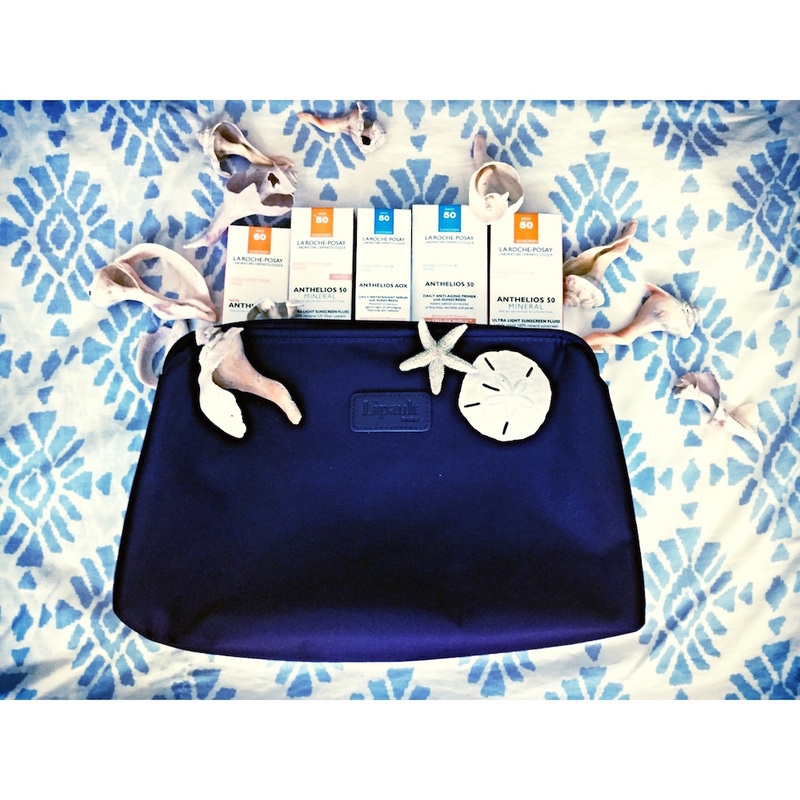 BAG it to go: This favorite weekend travel | cosmetic bag is practical for all your large size items like the sunscreens, with plenty of room for your other products- in my case, all the face and hair products too. If you’re like me and have to use 2 bags when you pack – even for the weekend, the Lipault Paris cosmetic (toiletry) BAG is for you. Plus, it’s lined and the craftsmanship designed for travel can withstand the weight of full size beauty products. And when I’m not travelling with it, it’s perfect to organize my special care large items without making a hot mess in my NYC bathroom. love your skin SUNCARE by Brigitte Segura. Lipault Plume toiletry kit. ($29).